Running 2Ks & Allison have begun this great repeating post they call Monday Memories. And it’s proven to be quite interesting. I’m trying to not only remember to write them myself, but also to read others’. So tonight when I went over to Anna's Place, I was amazed to begin reading Sarah’s account of Anna’s diagnosis with Biliary Atresia. Her story was so similar to Kajsa’s that I felt compelled to document a bit of our own story. I hope that’s OK with Sarah. I do hate to rip off ideas. But, Sarah, you just got me feeling such a sense of melancholic nostalgia. I was a single mom of Maya when I met my husband Chris. Maya had never seen a doctor in her life. She was cloth diapered, non-immunized, co-slept, etc. I would have even home schooled if I hadn’t been our sole bread winner. By the time Maya was 8, I had gone back to school to become a massage therapist and was teaching at Seattle Massage School/Ashmead College. That is where I met Chris. We became good friends, and after he graduated, I asked him out. The rest was history. Toni, our midwife, came by at day three to the heel stick. I cried and cried to think of anyone hurting my baby. It all came back normal. Kajsa was a bit underweight. But, we figured all babies drop at first. 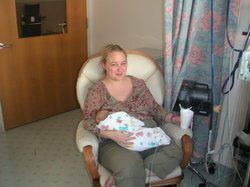 When Kajsa was still dropping at 2 weeks, Toni gave us the name of a very good pediatrician. Dr. Oriel is this neat little guy who reminds me of Peewee Herman with out the annoying laugh or off beat movie preferences. He had actually taught at Albert Einstein, and has a huge love of babies. We went to see him. He began to talk to us about vaccination schedules. We told him that just was not gonna happen. While he was not, OK with this he agreed that it was our decision to make, and asked only that we read his information, as well as the literature that we had based our decision upon. I was pumping around the clock and mixing my milk with formula at high caloric ratios to try to fatten her up. But she just kept dropping weight. We met Dr. Oriel at his office on the 4th of July for a weight check. Down, still. Then he met us there two days later on a Sunday. He was so befuddled by our little bird girl. So, he said that he’d really like to take some blood to rule out a few things. We said alright. We watched as he tried desperately to get blood from both arms. Finding this to be extremely difficult, we went downstairs to the lab. The woman there was eventually able to get some blood from her scalp. The poor girl was just SO dehydrated. We went over to Shaun and Chrissy’s old Enumclaw house that night for a visit and were just settling down to watch Lord of the Rings, when my phone rang. Dr. Oriel was on the line. Since he knew how little we valued Western/Allopathic medicine. He pulled no punches. I hysterically went tearing into the other room where Chris was playing video games with his friends. I’m not sure that dolphins could have understood me as I tried to relay what I’d just been told. Chris took the phone and got directions to MaryBridge. As we drove back to Auburn, I just kept wondering if this could all actually be real. I sobbed for the whole ride and just kept thinking that they must be horribly, horribly wrong. These things simply do not happen to me. I vacillated between disbelief and sheer terror. Chris said nothing and drove. We arrived safely (somehow) and were admitted to the seventh floor. Chris and I filled out what seemed like sooo much paperwork. (I can now do this in my sleep.) Chris stayed in the room as the IV specialists came up to draw more blood. I have an intense fear of needles; so a wonderful nurse named, LaDawn, took me to a soundproofed treatment room to figure out the unbelievably industrial looking breast pump. She talked to me about her son. He had some chronic illness. She and her husband had lived on an army base in Germany when he was diagnosed. Her experiences led her to change careers to become a pediatric nurse. This story would repeat itself over and over during our various hospital stays. The mommy nurses were always my favorites. They just got it. This is who can provide emotional support like no one else. It is from nurses whose children have had chronic illnesses that I learned how to be an unbelievable advocate for Kajsa. They are a resource to be valued, and never overlooked. They are, indeed, the key to hospital sanity. The next day we met one of our Nephrologists, Dr. Holloman and Neph Nurse/Case Manager, Teresa. 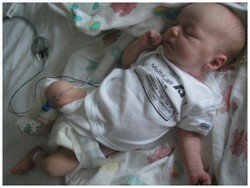 Dr. Holloman arrived that afternoon, after we’d already taken Kajsa down to radiology for an ultrasound of her kidneys. He told me that Kajsa had malformed kidneys. They knew that they were at the very least hypoplastic (itsy) but they were also likely dysplastic (chaotically formed). We found out that the only way to tell the difference was with a biopsy, and that the treatment would be the same for both. That was an easy decision. No biopsy. What took a while to settle in were the term Chronic Kidney Disease and Chronic Renal Insufficiency. We couldn’t believe that our daughter’s kidneys were smaller than my pinky fingernail. Well that’s about all I can take of this for right now. So, again taking my cue from Sarah, I’ll write more about life post diagnosis at another time. Thanks for lending an ear eye. That gave me the chills to read - what a nightmare to live through. You seem to be an old pro at this now. I know it can never be easy. I think some reople might not know how lucky they are when they get a real healthy baby. Oh I cannot even imagine living with the constant fear/angst/unknowns of your child being ill. It must be about the most out of control feeling in the world. Sending a little empathy your way...And I get all bent when I can't get my den picked up without the children continuing to drag stuff out. I've "heard" your name all o' the cyberplace, and will be back. Just had to stop by, lend a little lovin after reading that post, and also say that yes, we had pom poms, and the embroidered jeans?!? Rockin'. My mom wouldn't let me have anything so trendy as shoelaces dangling from my bum, I'm so jealous...I had a couple of monogramed sweaters and grosgrain ribbon ties for my buttondowns, though. I know that I sure as heck never knew what a good thing I had. I was too worried about being single and nobody loving me to stop, look down into my arms, and realize what incredible love was there. Maya's an amazing kid. But sometimes I feel incredible guilt that I never noticed just how great she is until life slapped me in the face with new realities. Am I really famous? So this is what it's like. Huh, not that different. Don't be fooled by my "mother of a chonically sick kid" status. A saint, I'm not. I still get bent when the kids leave a trail of crap behind my every effort. Ever watch Monsters Inc. I feel like that slug janitor monster who's always mopping up after himself. My neighbors have this magnet that says,"Cleaning while you have kids, is like shoveling snow when it's snowing." I told her it should really read, "Cleaning while you have kids, is like being repeatedly hit over the head with a shovel while you're looking at the pretty snow." On another note, what a drag your mom wouldn't let you have super white trash ghetto Daisy Dukes with embroidered skates and rainbow laces. What was she thinking? But then again, my mom told me that monogrammed sweaters weren't worth the money. There went all my dreams of growing up to work in a brewery with my friend Shirley. Moms! I cannot even begin to imagine the strength and energy it took to comprehend the diagnosis and to go on like you do. I am amazed by everything that your family does to ensure Kajsa is receiving the best care. Oh Rowan, my heart just aches for the pain you were going through during that initial diagnosis. I hope you keep writing this down--and I'll link to you--your story can touch so many. Hugs to you and that precious tiny girl, who is growing not-so-tiny now! I'm a true believer in life being about the lessons. I figure if I get it right, I don't need to worry about it later. I guess the good thing about this kind of stuff, is finding out your own merit. I have so much more strength (and sick humor) than I ever knew. That part is kinda cool. Isn't she getting big? It's amazing to think that she used to fit in Chris' hand. Yep, that was a hard time. I cried a lot. As I found out that it was manageable...albeit challenging, I cried less. I think you can just get used to anything. Of course I don't mind you stealing my idea. Actually, if you look at my sidebar under Anna's liver friends, and click on Natalie, her mom did the same. I am honored that I have influenced others. Your story is very similar to mine. Kajsa is lucky to have you for a mom, and very much adorable! Prayers are always being said for her! Awesome, so far, Rowan. Because I am a relatively new reader, I can't wait to hear the rest of the story. I guess I kind of knew that you had a child with health problems, but I didn't know the extent and I didn't want to pry. About my memory, it was a beautiful experience and a lot of people don't understand that. If you think of it in the right frame of mind, while it is sad, it is no less beautiful than birth. I was there when my father passed, too. I got to say good bye at the last moment of his life. How many people can say that? It is one of the most precious things to me. Well that's good. I'll have to go check out Natalie's site. It is somehow quite reassuring to meet other parents in similar situations. And like you have said of me, and I feel of you...I'm finding these people to be absolutely amazing and strong. Thank you for your compliments and well wishes. Please know that I return them. How blessed to have been able to be present for others as they pass. When Chris' father Paul left us we had the whole family gathered together. It was the end of Father's Day and full of the joy of being able to close old issues and say true farewells. 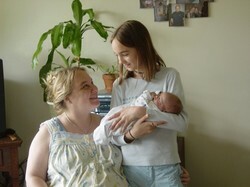 I've been a birth doula for 9 years. For this brief time it felt like a room full of death doulas...a loving presence to guide someone into the next existence. I gather that your experiences were similarly poignant. Thank you for your post. And thank you for your comment. wow. that story just... i don't know what i would do or how i would feel. well, yes i do. i'd be worried SICK. agree about "mommy nurses" getting it. they are so sweet. and i freaking LOVE your daughters name! HOW do you pronounce it? and where did it come from? i'm sure you've probably answered the origin question, but i'm a new reader to your blog and i would love to know where the name came from. Glad you love Kajsa's name. So do I. It is a Swedish name. It is pronounced Ki-sah with a long i (eye). From what I've read, the name means daisy, wich was just the clencher for me. When we were pregnant with Kajsa, Chris and I spent a ton of time trying to figure out a name for her. We actually had another name picked out, but realized at about 8 months that it just didn't feel right. So we began searching again. We were hoping to find something to honor our family histories. I'm mostly Irish, but most of the names are even more difficult to pronounce than Kajsa -- or they are already more popular than we were looking for. Chris' family is highly Norwegian, so we began to look into the scandinavian names. When we found Kajsa, we knew it was a good one. We actually decided upon her name the day before she was born. We did keep Gwyneth as a middle name for her. That way she has a little of the old celtic spirit, too. Hi, Rowan. That whole link isn't there and I can't get it with what I can copy. Is it possible for you to email me with the link? I would sure love to read it. Thanks. Sorry about that. Here's the full address. I guess it's a pretty long one. I had to divide it in two. I'll email it to you, too.